This one was too cute not to pick up. 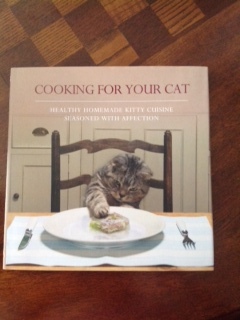 As I read through it I found several tasty looking recipes that I know my Kitties will enjoy. There is one recipe that I have been looking for about a year now. That is how to make homemade kitty treats. After attending a pet show and seeing a vendor have homemade pet treats that were super expensive I thought I could make them at home if I could just find the right recipe. Then I find this book. When I read it in this book and saw how simple it is, I could not believe it. I will be cooking for my four little fur babies this week. Yup my whole family is spoiled. I will post picks once I make the cat treats. I even have a cute little fish cookie cutter for them.